Our restaurant menu offers you a choice of meat, seafood, vegetarian and vegan dishes. All meals are freshly prepared in our kitchen. Chicken Tom Yum (hot) - Spicy pieces of chicken with mushroom, lemon grass, galanga, spring onion and coriander. Prawn Tom Yum Soup (hot) - Spicy tiger prawns with mushroom, lemon grass, galanga, spring onion and coriander. Tomkhagai Soup (mild) - Chicken in coconut cream with lemon grass, galanga, mushroom, spring onion and coriander. Prawn Tomkha Soup (mild) - Tiger prawns in coconut cream with lemon grass, galanga, mushroom, spring onion and coriander. Samosa - Served with dip and salad. Vegetarian Satay - Dip and salad. Chicken Satay - Lean strips of marinated meat cooked on bamboo skewers served with salad and peanut sauce. Spicy Thai Fish Cakes - Local fish combined with red curry paste, lime leaf, green beans lightly fried and served with sweet chilli dip. Jacket King Prawn - King prawn wrapped in light pastry, deep fried served with salad and plum sauce. Vegetarian Spring Roll - Served with salad and sweet chilli dip. Thai Red Chicken Curry (medium) - Chicken with mixed vegetables cooked in red curry paste with coconut cream. Thai Green Chicken Curry (medium) - Chicken with mixed vegetables cooked in green curry paste with coconut cream. Chicken Masaman Curry (mild) - Chicken, potato, onion, peanut and herbs cooked in masaman curry paste with coconut cream. Beef Masaman (mild)	- Beef, potato, onion, peanut and herbs cooked in masaman curry paste with coconut cream. Gangaree Gai (hot) - Chicken cooked in yellow curry paste with potato, onion and coconut cream. Lamb Masaman (mild) - Slow cooked lamb in masaman curry paste with peanut and potato. Lamb Mango (medium) - Slow cooked lamb in spicy curry paste with exotic herbs. Lamb Panang (medium) Slow cooked lamb in panang curry paste with mixed veg. Beef Mango (medium) - Slow cooked beef in a spicy curry paste with exotic herbs. Gang Ped (medium) - Duck cooked in panang curry paste with mixed peppers, pineapple with coconut cream. Beef Panang (medium) - Slow cooked beef with mixed vegetables cooked in panang curry paste with coconut cream. Chicken Tom Yum (hot) - Spicy chicken with mushrooms, lemon grass, galanga and herbs. Tomkhagai (mild) - Chicken cooked in coconut cream with mushrooms mixed herbs. Green Duck (medium) - Lean pieces of duck cooked in green curry paste with mixed peppers, sweet basil in coconut cream. Prawn Panang (medium) - Prawns cooked in panang curry paste with mixed peppers, sweet basil with coconut cream. Prawn Tom Yum (hot) - Spicy prawns with mushrooms, lemon grass, galanga and herbs cooked with tomyum paste. Seafood Hotplate (hot) - Scallops, mussels, squid, and prawns with mixed peppers and Thai sweet basil in a spicy sauce served on a steel plate. Seafood Hotpot - Scallops, mussels, squid and prawns with herbs, spring onions served in a steamboat in tom yum soup. Prawn Tomka (mild) - Prawns cooked in coconut cream with mushrooms and mixed herbs. Panang Seafood (medium) Scallop, mussel, squid and prawn cooked in panang curry paste with mixed peppers, sweet basil and coconut cream. Green Seafood (medium) Scallop, mussel, squid and prawn cooked in green curry paste with mixed peppers, sweet basil and coconut cream. Green Squid (medium) Squid cooked in green curry paste with mixed peppers, sweet basil and coconut cream. Panang Squid (medium) Squid cooked in panang curry paste with mixed peppers sweet basil and coconut cream. 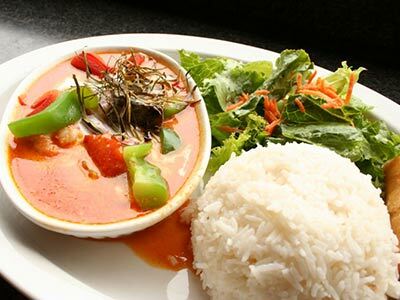 Thai Red Vegetable Curry (medium) - Mixed vegetables in season cooked red curry paste with coconut cream. Thai Green Vegetable Curry (medium) - Mixed vegetables in season cooked in green curry paste with coconut cream. Bean Curry (medium) - Mixed beans cooked in red curry paste with coconut cream. Phad Thai - Stir fried noodles with bean sprouts, spring onion, coriander and egg. Vegetable Stir Fry - Mixed vegetables in season. Stir Fry Cashew and Mushroom - With mixed peppers and onions. These are non spicy stir frys for those who do not want heat of chillies but want the flavour of Thai cuisine. If you like your dish to be spiced up, please ask when ordering. Thai Sweet and Sour Chicken - Non spicy chicken stir fried with mixed vegetables. 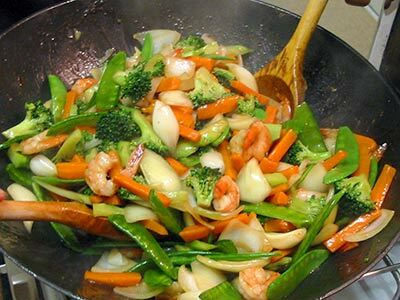 Thai Sweet and Sour Prawns - Non spicy prawns stir fried with mixed vegetables. Chicken Pad Thai - Stir fry chicken with noodles, bean sprouts, spring onions, egg and coriander. Prawn Phad Thai - Stir fried prawns with noodles, bean sprouts, spring onions, egg and coriander. Prawn Stir Fry - Black tiger king prawns in non spicy sauce with mixed fresh mixed vegetables. 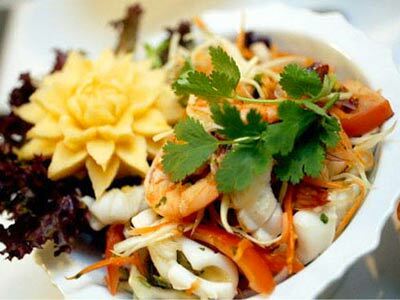 Prawn and Cashew (mild) - Prawn and cashew nuts with fresh mixed vegetables. Chicken and Veg. Stir Fry - Stir fried chicken with mixed vegetables. Chicken and Cashew Nuts - Stir fried chicken with mixed vegetables. Duck Stir Fry (mild) - Lean pieces of duck breast with fresh mixed vegetables. Wonderful fresh tasting food all cooked to order. This restaurant is small inside but it's quite a find and worth seeking out if you want an authentic Thai meal. We ordered chicken green Thai curry and a chicken stir fry, both were perfect and tasted so good. Definitely no hidden flavourings or nasties here as can be the case in some Thai restaurants. Service was friendly and would return when next in Ramsgate. The food here is amazing, look out for their Mango dish... You will not find this anywhere else. For a good value meal in a quiet atmosphere, this place is great. Highly recommended. Have been to this restaurant many times. Have never been disappointed. Always great service and excellent food. Very reasonable prices and a lovely view too! Lovely restaurant next to the beach with a friendly staff. The place was delicious, we recommend this place for food lovers. We visited without a booking on a Tuesday and got a table with no problem. The menu is short but the food is really delicious and the service was spot on. Was invited here by another couple, never really knew about it before. The man that owns it is really nice and he is happy to make dishes hotter if you want, he warned me it would be hot and it was! The food is tremendous , the service is great, I really can't hype this up enough. The view over the harbour is outstanding. The price was right so we left a decent tip. Not just the best Thai restaurant in Thanet. THE best restaurant. Good service bringing to your table superb food. Pad Thai, lamb curry, seafood hot plate, fried rice all came on preheated plates and tasted individual and delicious. No MSG here. Low-key service with the staff not asking you every 30 seconds if the food is OK... They know it's good! A little gem of a restaurant... Book as it fills quickly.